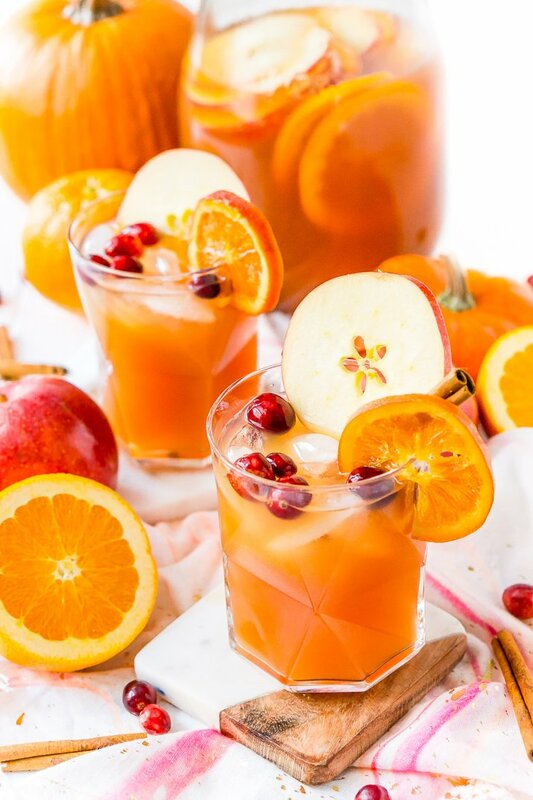 This Thanksgiving Punch made with apple cider, whiskey, fruit juice, brandy, and soda packs the delicious flavors of fall and winter in one delicious holiday drink recipe! 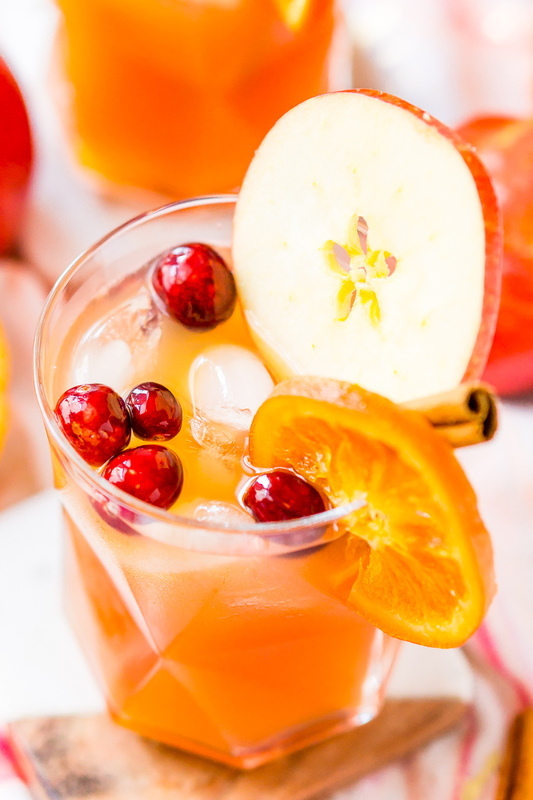 Thanksgiving Punch is the drink you never knew you needed when it comes to being around family! Just kidding (sort of). But let’s face it — a cup or two of the good stuff helps the conversation and the good times roll! When it comes to Thanksgiving Recipes, it’s easy to overlook beverages. However, a big bowl of homemade punch is the perfect way to help fill out the feast table. JUST TAKE ME TO THE THANKSGIVING PUNCH RECIPE ALREADY! 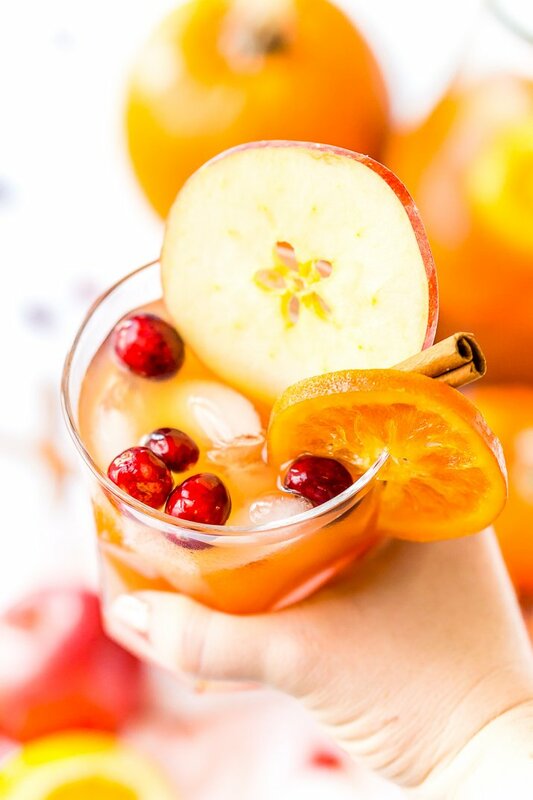 If you’d rather skip my (very helpful, I think) tips and tricks, essential cooking info, and similar recipe ideas – and get straight to this deliciously easy Best Ever THANKSGIVING PUNCH Recipe – simply scroll to the bottom of the page where you can find the printable recipe card. 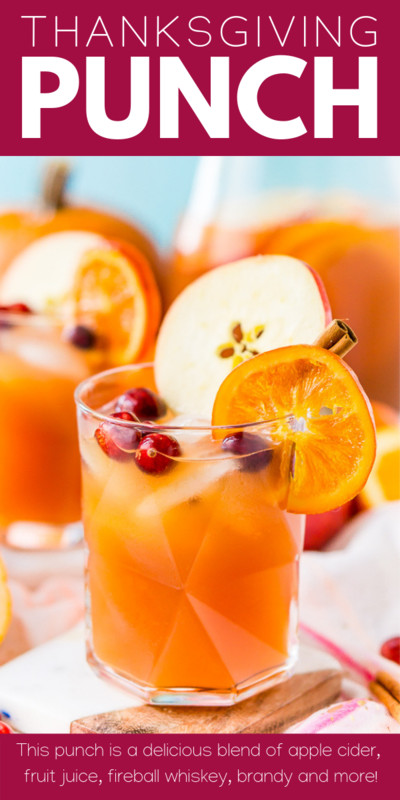 Needless to say, Thanksgiving Punch is a tasty signature drink to prepare if you’re hosting the big meal. It’s full of winter and fall flavors, plus some cinnamon spice that really packs a punch … get it?! 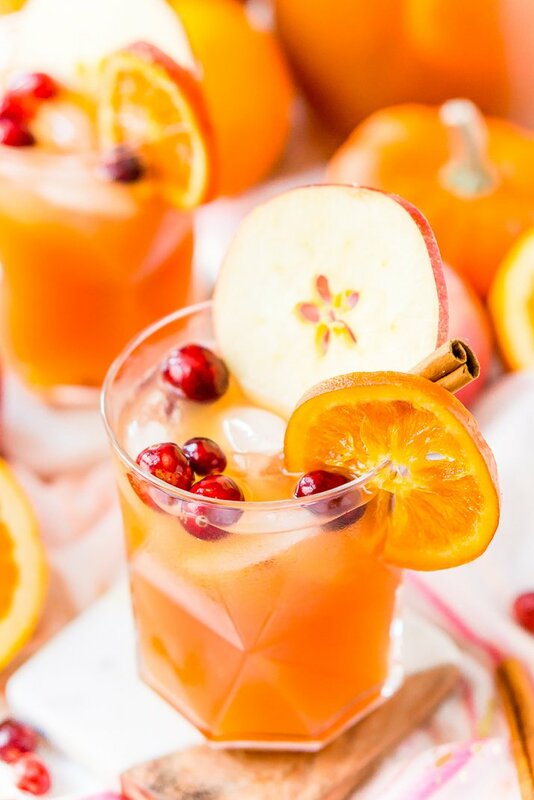 Fireball Whiskey and Apricot brandy spike this punch, then apple cider, orange juice, cranberry juice, and lemon-lime soda make it extra fruity and a little sparkly! For the best flavor, combine all of the ingredients except for the soda and ice in a large pitcher or punch bowl and refrigerate for several hours (or more), add the soda and ice just before serving so it’s fresh! Obviously, this Thanksgiving Alcoholic Punch isn’t for the kiddos, but they don’t have to be left out. Just make another batch without the hard stuff, and it’ll be (almost) as good! And don’t forget about the presentation! Go all out with a pretty punch bowl (this is the one I have) or dispenser, festive cups, and holiday-themed straws. If you really want to up the “wow” factor, a few floating citrus slices look beautiful in a clear server. And have some fun with garnishes: drink picks, candied orange slices, and cranberries always make drinks look extra fancy! If Thanksgiving Punch is a hit on Thanksgiving, make it for Christmas, Hanukkah, and New Years, too! The cozy notes of apple, cranberry, and cinnamon make it perfect to enjoy all season long. … in fact, maybe this recipe should be called “Holiday Punch,” instead! But you should definitely try my Christmas Punch, Christmas Sangria, and New Year’s Eve Punch too! Beer and wine are good for gatherings, but when it comes to celebrations, something special is in order! 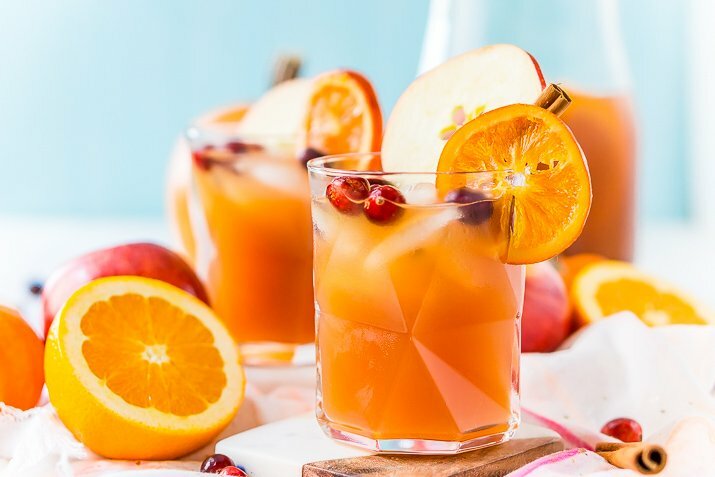 Thanksgiving Punch is the perfect cocktail to enjoy with friends and family this holiday season, and it’s always a hit. Immediate Serving: Combine all ingredients in a large punch bowl or pitcher. For A Stronger Flavor: Combine all ingredients except for the soda and ice in a large punch bowl or pitcher and refrigerate overnight. Add soda and ice just before serving. 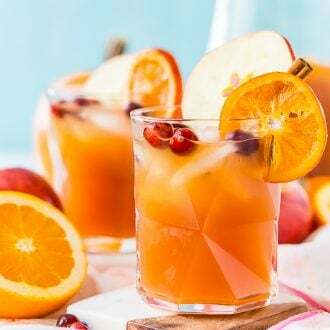 If you do not have apricot brandy, another fruit brandy like apple or blackberry could be used. Made this last weekend for friendsgiving and it was a huge hit. Love the spicy notes! This punch was a huge hit at our Thanksgiving celebration. So easy to make and I got so many compliments.